T H E S O N S A N D D A U G H T E R S O F D O U G L A S S, I N C.
We celebrate the history and tradition of the former Douglass High School of Kingsport, Tennessee, the Riverview Neighborhood and the heritage of South Central Kingsport, Tennessee on this website. 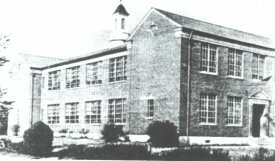 At the time of its closing in 1966, Douglass High School in Kingsport was the largest African-American high school in Upper East Tennessee, Southwestern Virginia and Southeastern Kentucky. Donations and contributions to the Sons and Daughters of Douglass, Inc., of Kingsport, Tennessee, a non-profit corporation, are tax-deductible, in accordance with Section 170, under Section 501(c)3 of the I.R.S. Code. Gifts, bequests, devises and transfers to the Corporation are also tax-deductible under Section 2055, 2106, or 2522 of the Code. These certifications are on file with the I.R.S. and the Corporation, and viewable upon request. Click here to read the Sons and Daughters of Douglass Inc.'s corporation by-laws, as adopted by its Working Board and Executive Board. manager and the owner of the materials/photos.